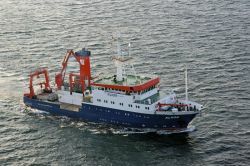 Cruise 412 of the German research vessel ALKOR (22.03.-08.04.13) led by Dr. Peter Linke (GEOMAR) is conducted in the framework of the EU project ECO2. The project, supported by a team of international collaborators, investigates the potential environmental impact of the storage of carbon dioxide (CO2) in marine sediments. This is being performed at existing CO2 storage sites in the North Sea and the Barents Sea paired with a comparison to natural marine gas emission sites. The first target of the researchers on board the ALKOR is the Norwegian Utsira sand stone formation, which has been used since 1996 for CO2 storage in parallel to gas production. Already in 2011 during the first ECO2 cruise, initial investigations on potential gas emission sites were conducted on board the ALKOR, followed by 4 cruises in 2012 with the RVs HEINCKE, G.O. SARS, JAMES COOK and CELTIC EXPLORER. The expeditions complement each other to efficiently use valuable ship time. At this time, on board the ALKOR are the ROV PHOCA, one lander, a video-guided CTD as well as a 4 m-long vibro corer. With this suite of instrumentations selected sediment and water samples will be obtained to close gaps in the data obtained so far. In addition to the Utsira formation, the so-called blowout crater in the British sector of the North Sea will be investigated, where high quantities of methane have been emitted for more than 20 years following a failed drill attempt. Ideally, this unplanned long-term release experiment can be used to estimate how much methane is emitted from the seafloor and its resultant distribution in the water column. The challenge of the cruise in this season is to investigate a late winter situation where a stratification of the water column is not established yet and where larger volumes of the green house gas might escape into the atmosphere. Nevertheless, all participants hope for calm weather conditions to achieve their ambitious aims.